Live a Colorful Life: Top Ten! Well, this has never happened to me before. 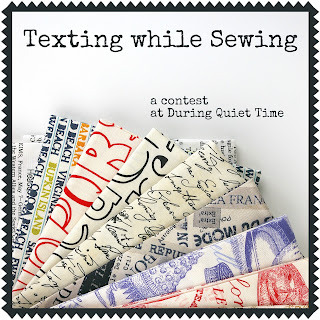 I submitted my Texting While Sewing block, and it made the Top Ten! There is a lot of stiff competition but I'm thrilled to have made it this far! I saw your block there. Congrats! Congrats! Your block is awesome so I'm not surprised! Doesn't surprise me at all! It's awesome and it'll probably win!! Good luck!! well of course - it's brilliant! I totally knew you'd make the top ten, because your block is brilliant. I think you'll win the whole thing! I am SO HONORED to be on the list, myself, next to the likes of you! Congrats! I love your creation and hope you win! Cool! Your block rocks so you should win it all the way! I CAN believe it. It's a wonderful design! You're very clever. Congratulations! I KNEW it! Congratulations on your well-deserved top 10 spot!! Well done! You totally deserve it! Oh---so yours was the SmartPhone. You are sew sew amazing. I loved it! Glad to know that it was yours.